The AIDA model is a tried and testing marketing method, which is employed by businesses of all sizes. If you’re hoping to improve your content marketing strategy and drive sales and you’re not already familiar with the AIDA funnel, this guide could help to transform your campaign and catapult your company to the next level. Here is an introduction to the AIDA marketing model and some tips to boost your content marketing strategy. 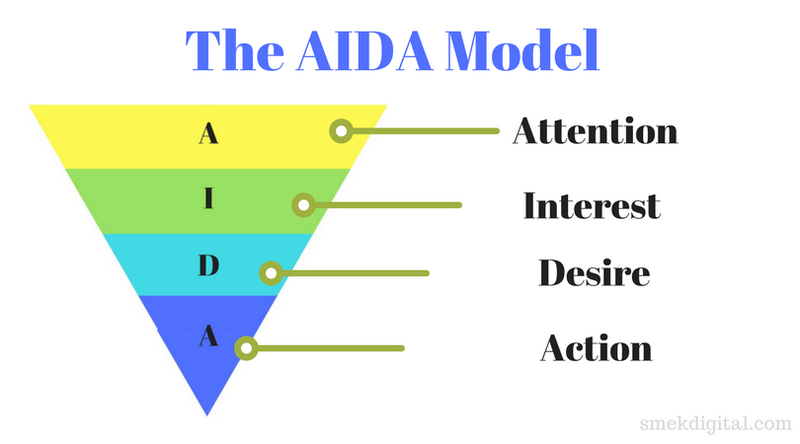 The AIDA model is a golden oldie in the marketing world. Although the concept has been around for a period of time, the model can be adapted and adjusted to suit modern businesses working on current, relevant content marketing strategies. This formula is designed to guide consumers through every step of the buying process, using content to draw customers in, peak their interest and ultimately, urge them to make a purchase. The aim of the AIDA model, when applied to content marketing, is to take a consumer on a journey that attracts their attention, captivates their imagination, maintains their interest, makes them want the product or service and then urges them to take action. If you can perfect the process, you’re likely to notice a major upturn in sales. The important thing is to complete every step. If you’re getting to stage 1, 2 or 3 every time, but failing to close the deal at the last chance, it’s wise to revise your strategy to increase the chances of success. Many businesses use content marketing as a means of promoting their products and services, enhancing their brand image and reaching out to new clients. It’s well-documented that content marketing can be incredibly effective if it’s done right. Content marketing isn’t just about stuffing blogs full of key phrases and popular search words. It’s about creating original content, which is appealing and enticing to the reader. 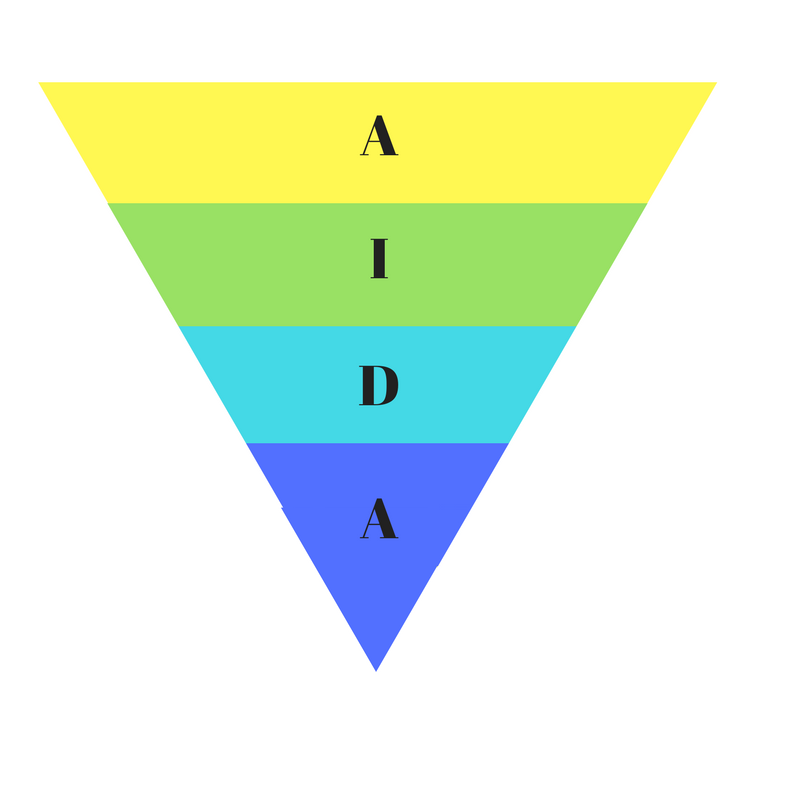 If you take every aspect of the AIDA model into consideration, you create a content funnel, which takes your potential customer on a journey. The first step is to grab the attention of that client. You want to arouse curiosity and encourage that person to want to find out more. The next stage is to build that client’s interest in whatever you’re selling. You want to use your content to make them think about how they would use that service or how that product could benefit them. The next stage is to make the reader want to buy that product or embark on the experience you’re offering. If you’ve navigated your way to this stage, the final step is to push that customer into taking action, for example, booking that excursion, reserving a table in your restaurant or completing the purchase of the item in their shopping cart. To achieve success, you have to get from the beginning to the finish line. In its most basic form, the AIDA model sounds like the process we all go through when we buy something or place an order. The key to using AIDA to boost your content writing strategy lies in making the campaign relevant and understanding what the client wants. You need to know how to get from one stepping stone to the next, keeping your reader with you at all times. To design the best strategy, it’s helpful to break down the model and consider each element in more detail. This is arguably the toughest challenge. You only have to carry out a quick Google search to notice that there’s a huge amount of content out there. When you’re putting a post, an article or a landing page together, think carefully about how you’re going to make your content leap off the page and turn heads. Plan content creation with the audience in mind. Remember at all times that you’re catering to an audience and anything you share or distribute should be tailored to that specific group. Carry out some research to ascertain information about who is reading your articles and what your audience wants from your posts. Ask questions, and don’t start working until you have the answers. What problems are they interested in tackling? What solutions can your content piece offer? What are the most effective and popular ways of getting your message across? If you have the responses to these questions, this will stand you in good stead to create pieces that do the job. One of the best ways to grab attention is to create a punchy headline, which leaves the reader wanting more. Be original, think outside the box and adopt a tone that suits the audience. There are many different writing styles out there, and you should use language and terminology that will resonate with the reader. If you’re selling skateboards to ambitious, energetic teenagers, for example, your language is likely to be very different to selling bespoke legal services to business managers. It’s well-known that people have a short attention span when it comes to reading articles either online or in print. After the headline, the first paragraph should be your priority. Don’t wait until the last sentence to try and win your customer over. The chances are that you’ve already lost them if the previous paragraphs are bland and void of useful information. If you’re worried that your content strategy isn’t working as well as you hoped, audit the headlines and primary paragraphs first. These are the areas where you are most likely to experience issues that hold you back. Once you’ve lured a reader in, the next challenge is to maintain their interest. One of the best ways of doing this is persuading them that you have an in-depth understanding of the problems or issues they face. Take the concept of ‘Dr. Google’ as an example. It’s incredibly common for people to use search engines to find out about symptoms and learn about health conditions these days. If you’re writing a piece about health, it should be your mission to demonstrate that you understand the topic and you have an insight into how it affects sufferers. If you can show that you appreciate how a specific condition makes that reader feel, for example, you can increase the level of engagement and form a deeper connection. You want your reader to think that this is a piece that has been written with them in mind. Use research statistics, expert analysis, and case studies to demonstrate and support the claims you make and build your story. It can also be useful to share personal experiences, as this can reassure the reader and make them feel more connected to the author. It can sometimes be difficult for writers to distinguish between interest and desire. Maintaining interest is key to reaching the stage where that person starts to think about actually wanting or desiring that product or service. There’s a big difference between reading something and thinking that the product the business is promoting is a great idea and browsing an article and deciding that this is something you definitely need in your life. If you’re selling a software program, for example, you need to take the buyer from a stage where they think that the product sounds brilliant to the point where they really want it, and they’re willing to take the next step and place that order. This is the final piece of the jigsaw. The action phase relates to tipping that reader over the edge and turning interested and desire into actionable results. If you’ve created a press release for a new skincare brand, for example, the final phase would be a customer placing an order or a buyer shaking hands on a deal. Every piece of content you write or post should include a call to action, which makes your intentions clear and points the reader in the right direction. Make it simple for the audience to take that step, for example, including a click to buy link, and try and preempt issues that could prevent the reader from taking this final leap. If people are worried they won’t like the product, offer a money back guarantee or outline the returns policy. Offering reassurance at this point is often an effective means of tipping the balance in your favor. Linking to landing pages is an important part of generating leads and driving sales. Landing pages take you straight from a search engine to a page that is relevant to what you’re looking for. The process should be seamless and quick. If you’ve managed to increase traffic to your landing pages, the last thing you want is for customers to lose interest and look elsewhere because the page doesn’t deliver. Your landing pages should focus the client’s attention on specific services or products, provide useful information and, most importantly, persuade the customer to take action. Your landing pages should be structured according to the AIDA model. Use headlines and opening statements to grab the attention of the reader, peak their interest by telling them more and backing up your claims and then use images, clips and persuasive language to make them want it. Make sure there is a call to action, and that the page makes it as easy as possible for the reader to take that step. It’s always beneficial to match the call to action to the headline and to try and predict objections and provide solutions. FAQ pages and live chat features are an excellent addition to any business website. Try to avoid stuffing pages full of text, as this can be very off-putting. Use images, videos and infographics to break up paragraphs, and be succinct and concise. Be punchy and get to the point. Are you keen to embrace the power of content marketing to push your business forward? If you’re using paid adverts, you’re sharing content on social media, or you’re hoping to improve your search engine ranking or create more leads using landing pages, adopting the AIDA model could make all the difference. Hopefully, this guide has given you an insight into the theory and provided you with useful tips to create a compelling, captivating and effective content marketing campaign.